Neurogastroenterology is a discipline of gastroenterology, aimed at understanding the neuromuscular control of gastrointestinal function, with particular emphasis on brain-gut interactions. 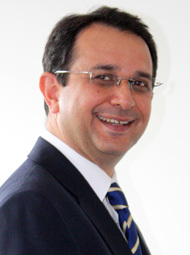 The Neurogastroenterology Group represents a collaboration of experts, both clinicians and scientists, from several disciplines within the Blizard Institute of Cell and Molecular Science, Barts and The London School of Medicine and Dentistry, and Barts and The London NHS Trust, who are working collaboratively to advance basic scientific study, and translate this knowledge to enhance patient care. Our strategic objective, through a state-of-the-art translational neurogastroenterology research programme, based on a molecule-to-man approach, is to create a world-leading centre of excellence for the diagnosis and treatment of patients with functional gastrointestinal disorders. Translational research programmes exist in visceral pain, GI neuromuscular disorders, gastro-oesophageal reflux disease, colorectal disease, nausea and appetite, surgical innovation, drug discovery, and other novel areas. Each research programme is led by a theme leader, and is supported by research grants from diverse sources. Abdominal pain in functional GI disorders: is it all in the mind.